"The use of words expressing something other than their literal intention! Now THAT... IS... irony!" A character wrongly declares some situation to be ironic, and another character corrects them. Often, irony seems to be something just not everyone can grasp. Compare to You Keep Using That Word and Sarcasm-Blind. In the movie Reality Bites, Lelaina was refused a job because she was unable to define irony. She then complains to Troy that nobody knows what it means, and he promptly replies with a clear and succinct definition. Though it seems even Troy doesn't know what it is, since his definition "when the actual meaning is the complete opposite of the literal meaning" is contradictory to the point of bordering on paradox. A running gag in Discworld regarding dwarves is that they are so straightforward, serious, and unimaginative that they think that irony means "something like iron." It technically does (second entry) , but it's definitely not the most common usage. In Jam by Ben Croshaw, the central gag of the Bagmen living in a mall is that their group was founded by a bunch of young people on some survivalist internet forum, who constantly misuse the term irony due to Memetic Mutation. Tim eventually calls them out on this while campaigning to become their new leader. Shawn from Psych in one episode. Gus: That's not irony, Shawn. Jason Alexander as host of Saturday Night Live hosted the Show Within a Show "Tales of Irony," during which he complained that none were ironic. An episode of The King of Queens had Doug call something ironic and Arthur insist that that's not what irony is. At the end of the episode, Arthur wakes Doug up in the middle of the night claiming he looked up ironic in the dictionary, and admits he was wrong: he thought "ironic" meant "made entirely of iron". Nina: You know what's ironic? The same day I ran Elliot down, is the same day I ruined his life forever. Maya: That's not ironic, that's what happened! Elliot: It's ironic, but you running me over that night may have been the best thing that ever happened to me. Nina: Elliot, that's not ironic, that's what happened. Inversion from Castle: Castle and Beckett are able to identify a murderer because he sends someone to retrieve the victim's mail, which contains evidence that points to him as the killer. Beckett notes that it's ironic that the murderer's efforts to cover for himself got him caught, since the cops weren't planning to check the victim's mail and would never have found the evidence. Castle immediately thanks her for using the word ironic correctly. Castle: It's a common mistake, but it's not ironic that Dr. Cosway's not here for you to lean on. It's just simply tragic. It would be ironic if her death made you feel better. An episode of the short lived series The George Wendt Show contains an example. When someone said something sarcastic, George responded as if he took him seriously. Someone else then said condescendingly, "He was being ironic," to which George replied, "Actually, he was being sarcastic. But it's ironic that you didn't know that." 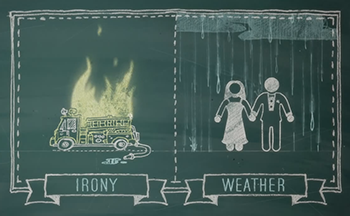 The right side of the picture, showing rain on someone's wedding day, is a reference to the Alanis Morissette song that is the trope namer for Isn't It Ironic? note But isn't it ironic that nothing in a song called "Isn't it ironic" is ironic? Many comedians (in particular Irish comic Ed Byrne) observed that the Alanis Morissette song "Ironic" did not contain a single thing that was ironic, but that may be the point of the song. Herbert Lindenberger, professor of comparative literature and English at Stanford, went on NPR to explain that the Morisette song had perfect examples of situational irony and cosmic irony. So apparently, it's pretty (drumroll please) ironic when people claim that the examples in the song are not ironic. According to people who are a lot more educated than most of us. "Now that you have a billion dollars, perhaps you'd like to buy yourself a dictionary, because irony is not a black fly in your chardonnay. Irony is a Scotsman cloning a sheep. Irony is renaming the national airport after the president that fired all of the air traffic controllers." One of Jon Lajoie's many rapper personas (from "WTF Collective") is MC Doesn't Know What Irony Is. He really, really doesn't. In this strip of The Non-Adventures of Wonderella, Wonderita receives an ironic curse that isn't. And then another curse that isn't a curse at all. TT has a personal stake in this; if there's one thing the Strider boys are totally sincere about, it's irony. In the Spin-Off comic ParadoxSpace Karkat and Vriska have an exchange like that during "Con Faire." Vriska: Define irony........ A bunch of idiots who don't have a chance against me!!!!!!!! Karkat: THAT WAS NOT IRONIC AT ALL, VRISKA! In Alien the Alien, Bonnie says that she is so "ironic". Somebody offscreen points out that that's not what irony is. She says instead that she's "unironic, vain, unironivain, vainunironic". Dr. Ironologue: The irony! To be crushed by a giant gorilla... on my birthday! Science Guy: That's not ironic. In the season 2 finale of Red vs. Blue, Grif comments on the irony of the two rival teams being forced to work together, which prompted an argument over whether the scenario fit the definition of "ironic." Grif: So now the reds and the blues have to work together. How ironic. Simmons: That's not ironic. Ironic would be if we had to work together to hurt each other. Donut: No, ironic would be if instead of that guy kidnapping Lopez, Lopez kidnapped him. Sarge: I think it would be ironic if our guns didn't shoot bullets, but instead squirted a healing salve that cured all wounds. Caboose: I think it would be ironic if everyone was made of iron. Church: Okay... so we all agree that while the current situation is not totally ironic, the fact that we now have to work together is odd in an unexpected way that defies our normal circumstances. Is everybody happy with that? Dave, the Inner Hipster of Film Conscience. "You're missing the point, man. Was Plan 9 purposefully ironic? Troll 2? The Room? What do those movies have in common?" "You have a T-shirt for each of them?" In Sword Art Online Abridged, what makes Kirito and Asuna start to really appreciate Yui is when she corrects Yullier that the "peace conference" in a dungeon that turned out to be a trap her husband fell into isn't ironic, but closer to "completely expected." Yulier: Wha... what are you talking about? Yui: Irony, noun: "A state of affairs or an event that seems deliberately contrary to what one expects, and is often amusing as a result." Example: Your leader is named Thinker, yet he appears to be something of a dullard. Kirito: Holy cow, Yui! That was amazing! I wish I had like a tiny mic for you to drop! Asuna: Oh my god, that would be adorable! In Frisky Dingo, when former billionaire Xander Crews winds up homeless, the documentarian says it's ironic how he's now living in cardboard boxes produced by the company he used to own. Xander says that's not what irony means, while the documentarian replies that that's exactly what irony means. A running gag in the Futurama episode "The Devil's Hands are Idle Playthings" is Bender correcting the Robot Devil on his use and abuse of the word "irony". However, the first instance of the Robot Devil's use of irony is actually a form of situational irony. You think the wheel is going to land on Bender's name, but it hits the Robot Devil's instead: Bender's statement "It's not ironic, it's just coincidental!" is not only incorrect as it is in fact ironic, but it is not coincidental. However, Bender is still correct from his point of view, since the characters had no inclination on where it was going to land, and without narrative causality, it was just a coincidence.